The lead artist is Siyabulela Bhele Jiyana, known as the people’s percussionist and founder of the band Matimba. The band agreed to profile the event with the focus on the people’s percussionist, Sabu Jiyana. Siyabulela Bhele Jiyana (hereto referred to as Sabu) is from KwaLanga Township in Cape Town South Africa. He is a multi-instrumentalist, musical practitioner and co-founder of South African groups namely Matimba (2016), Addis Ababa Ensemble (2012) and Abavuki (2001). He completed his post-graduate studies in music performance at the University of Cape Town South Africa, College of Music. Sabu’s musical career spans over seventeen (17) years with performance across Europe and Africa. In 2016, he started a solo project named “Matimba” which means strength in Xitsonga. 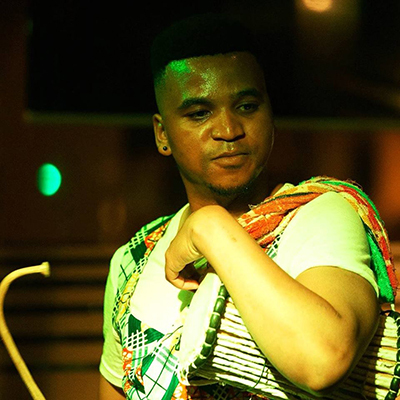 Sabu finds his inspiration from Afrika, its diverse cultures, its dynamics and those spearheading Afrikan music such as Dizu Plaaitjies (with whom he performed and travelled internationally) Fela Kuti, Miriam Makeba and Salief Keita. His music aims to give an Afrikan history lesson; provoke the minds of audiences, while preserving Afrikan stories, indigenous instruments and Afrikan languages.